What's gluten free at Tutti Frutti Breakfast and Lunch? In general, we heard mixed reviews about Tutti Frutti. A soon as we heard they have gluten free options we decided to check it out first hand for lunch. First things first, what do they have gluten free on their menu? Plenty! The great thing is that you are not just limited to eggs and potato. 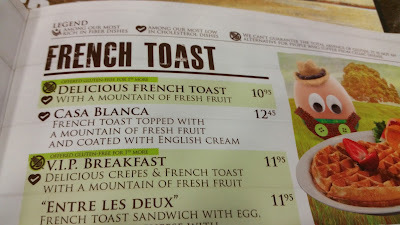 They not only have gluten free toast available, but they will milk gluten free french toast and crepes. Not every option can be made gluten free, but you certainly have enough options available. 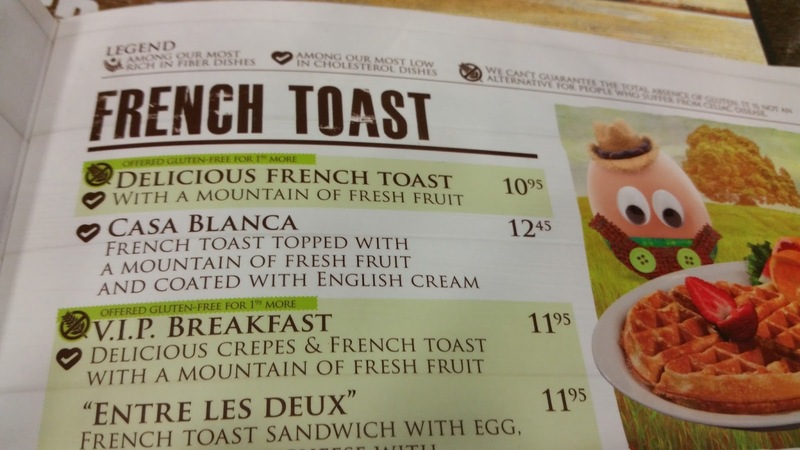 Check out a picture of their menu. Menu items that can be made gluten free are clearly marked with a circled wheat husk with a line through it. 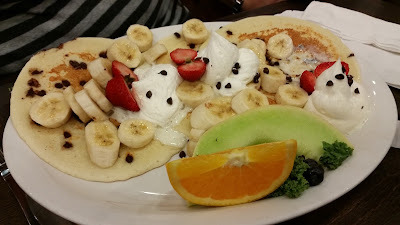 Amanda tried one of the crepes with banana, strawberry and whip cream and season fruit on the side. Although it tasted good, she was a little disappointed at first because the crepe seemed more like a pancake. But when our daughter got hers, and it was similar, we figured that is just how they made some of their crepe orders. The food was certainly tasty and a good portion for the price you pay. A place that we would go back to for a breakfast or brunch. So just a few facts about Tutti Frutti; it is just a breakfast and lunch place, so it closes by 3pm every day. Also the inconsistent review we've heard about them, was never about the food, but the service. We did experience extremely slow service that we didn't expect. Made it a bit challenging to fend off two hungry kiddo's while we waited 30 minute for our food. We are hoping that was just a one time thing.